With the determination of a kid with a non-horsey family. 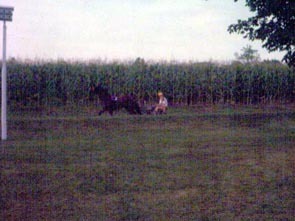 Donna grew up on the back side of a excersize track for Standardbred Racers. 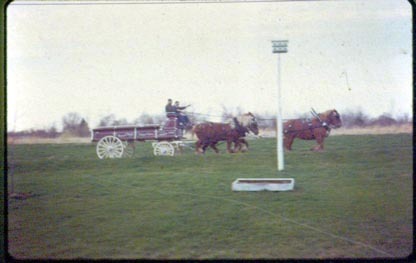 The barns thier also housed the Belgium Hitch, Prairie Farms Horses. 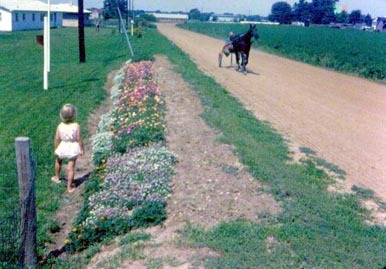 Donna and her sister visited the barns frequently learning how to drive the sulky cart horses. 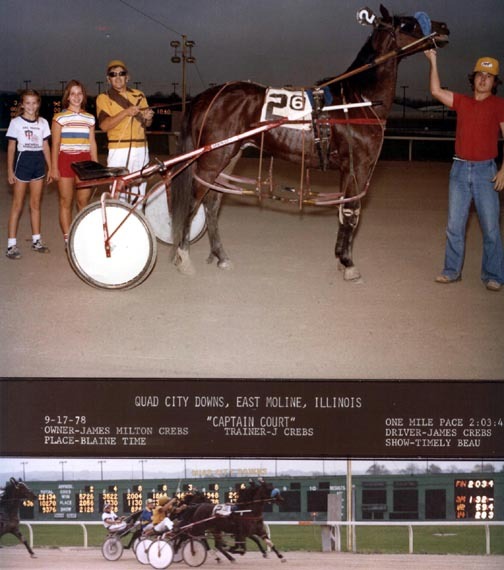 One Standardbred pacer in particular was named Captain Court. A Weekend before Donna's eleventh Birthday her Family took a picnic lunch with friends to Navoo, IL. along the Mississippi river. 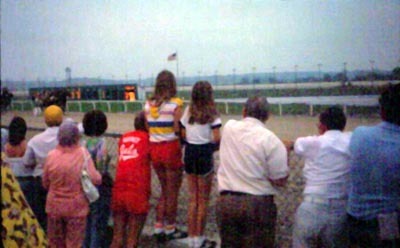 Instead of heading home after the picnic, they drove up to the Quad City Downs, surprising Donna. Captain Court was going to be running in a race that evening. Standing by the fence her heart in her throat ,she cheered on Captain. Boxed in on the inside second to last Captain and his owner pulled back to last. Donna ,tears swelling up inside, couldn't watch Captian lose. Donna's Mom yelled "Donna look He's coming up on the outside". With great joy The whole family screamed "GO Captian GO"
Flying across the finish line Captian WON!! 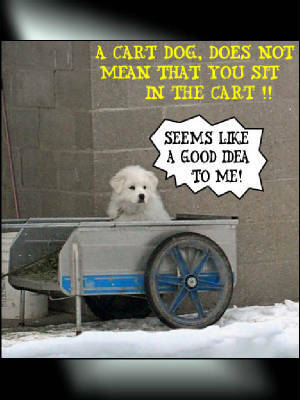 His owner drove past Donna and her family, Mrs. G and friend Kathy. Calling out You girls want to come and get your picture in the Winners Circle? Captian Won today for you!!! 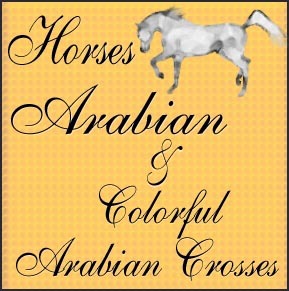 Donna's first horse at the age of 23 was a little grey Arabian named Hakeen- Keener was a wonderful old gelding that started Donna off by taking care of her. Keener was only in our lives for 2 short years, most of which Keener was ill, We learned so much about horses and what it takes to be the care taker of these magnificent animals. Keener bless his heart after a Vet had told us He should be put down. Another Vet Saved his life. Even Though once he had his health again for about 8 months Keener had an aneurysm while out on the trail and died in Donna's arms. Then Donna and Jim searched for Months for just the right horse to procede with for Donna's horse companion and bought CF Chesapeake Bey,a Bey Shah grandson. 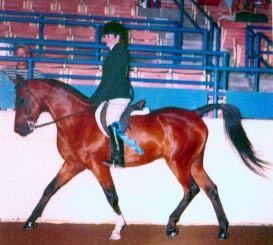 He was the first of our Show horses. Soon after we acquired Aysa Gambler Rose, a Raffon bred 2 year old filly. 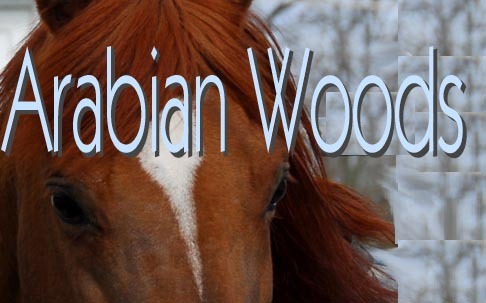 With her we received a breeding to an Egyptian bred Stallion. Along came Leelah Rose from the match, my husband's first horse that gave Him the Horse Virus. After 7 years, Her Daughter Hallie is going to have to replace Jim's first horse Love, Lee died 7 days after Hallie's arrival of Colic June 7th, 2006. Chessie was showing so well for Donna He became such a great partner for her. 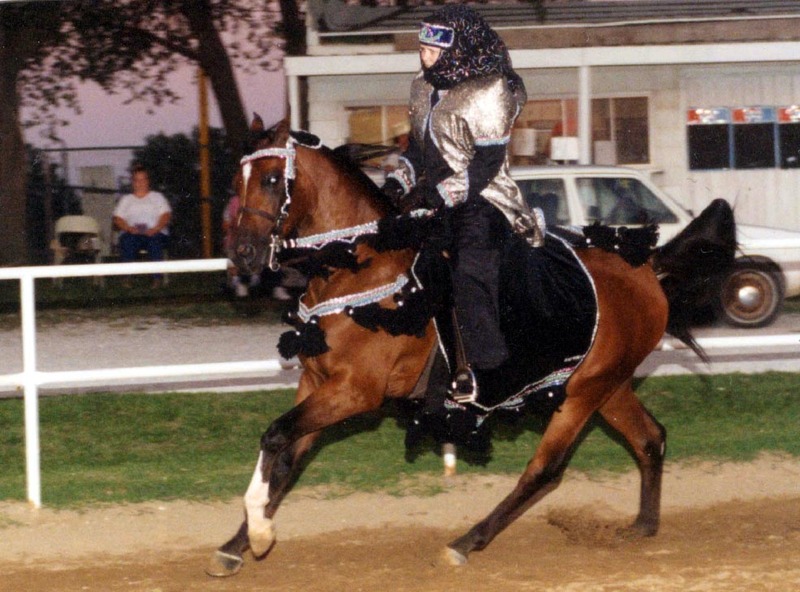 We had him qualified in 1999 for Regionals in several classes. But unfortunately he developed EPM. After so much time and trial and error of the new medications they were developing He survived and is doing well. 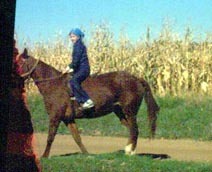 Now he is only used for walk trot classes and trail. We are just very happy he is still in our lives. 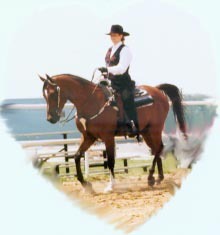 During those years Donna went to Illiamo Arabians and with a years worth of payments bought 4 Horses to add to our farm. Illiamo Zorro, Illiamo GI GI( Now owned by Waynette Wallace and what a great home she has), Xennon, And Salina Raffon. 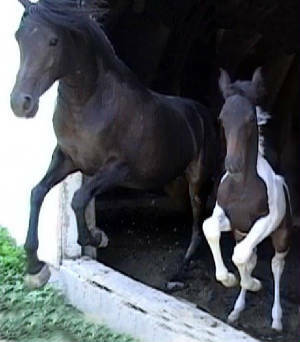 Also, Aysa had 2 other foals both have incredible homes one in MASS that was sired by Illiamo Zorro and the other Sired by Wallstreet Journal, and owned by My very good Friend Sandy Thomas. Big Beautiful Shaka Rose. Since, We have been inspired to breed equally incredible animals as our beloved Chessie. 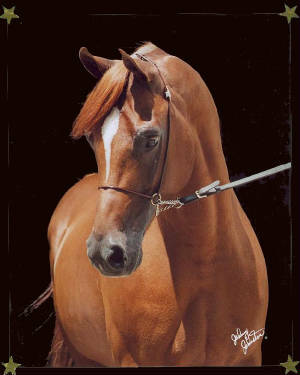 We found Bey Shahn to breed Aysa to a Bey Shah son and the match brought us Mya Shahlah Rose.Now Halter Champion Iowa Gold Star 3 year old fillies in 2004. We were so impressed by the outcome. Jim strollling the stalls at Salem Childrens home in Flannigan, IL found LD Echshahlon our Bey Shah Son by Canadian National Champion Halana. When we first discovered him there, we could not believe our good fortune. Jim and I barely had a chance to discuss the turn of events. And WOW Echshahlon Sweepstakes Nominated Sire, by Bey Shah was ours. We received a long stem rose as a thank you from the Salem Childrens Home for your purchase. Jim and I always refrained from buying each other flowers. So this was my first Rose from my husband, In 15 years of Marriage, IT WAS REALLY WORTH THE WAIT. The rose was all we had for a week to remind us of our exciting new purchase. Echshahon has become a wonderful addition to our horse farm. He has been getting acquainted with some of our broodmares. The 2005 foal crop was so beyond our humble expectations, Gi Gi the exquisite Black mare, that is related to Zorro, bred to Echshahlon produced June 2nd 2005 a Beautiful Seal-Black Colt. 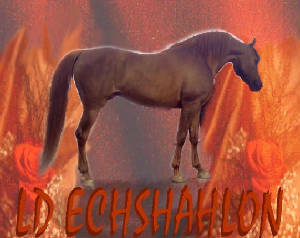 Now 2006 We were blessed by 2 foals out of Aysa and Lee by LD Echshahlon. Aysa Produced April 9th 2006 a brand new Champion AW Khan Shahlon, Big, Black & so Very Handsome. Now AW Hallie Bey You Can't Miss her She is at the top of the page. Lee really left us with her gift of such a grand little girl by LD Echshahlon.. In 2004 We decided to branch out and add some color to our fields. Aysa was bred to SS Painted Intimidator. Pleased with Half-Arab Pinto AW DUQ - 2004 Jr. Champion Res. at the American Royal in Kansas City. 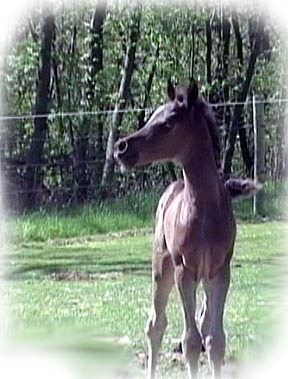 another Pinto by Aysa's daughter, Leelah Rose was Born April 2005 Colorful Arab Cross, He is reg. 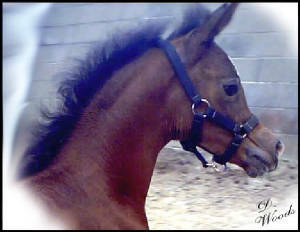 Half-Arab and NSH(pending) with a fantastic matching markings and Hooky Neck. Pictured is CF Chesapeak Bey at 1999 Arab Inc.